Campaign for the American Reader: Pg. 99: Deanna Fei's"Girl in Glass"
Pg. 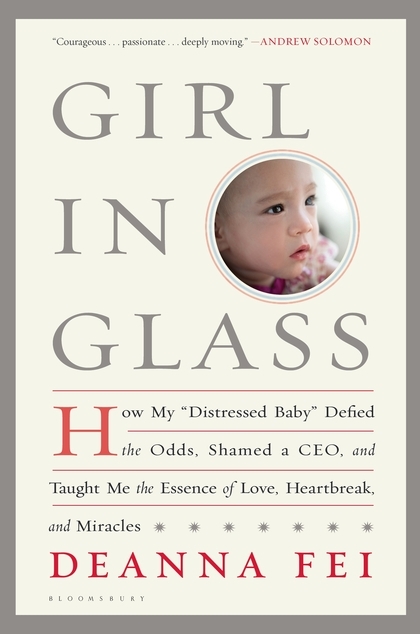 99: Deanna Fei's"Girl in Glass"
Featured at the Page 99 Test: Girl in Glass: How My "Distressed Baby" Defied the Odds, Shamed a CEO, and Taught Me the Essence of Love, Heartbreak, and Miracles by Deanna Fei. Deanna Fei was just five-and-a-half months pregnant when she inexplicably went into labor. Minutes later, she met her tiny baby who clung to life support inside a glass box. Fei was forced to confront terrifying questions: How to be the mother of a child she could lose at any moment. Whether her daughter would survive another day--and whether she should. But as she watched her daughter fight for her life, Fei discovered the power of the mother-child bond at its most elemental. A year after she brought her daughter home from the hospital, the CEO of AOL--her husband's employer--blamed the beautiful, miraculously healthy little girl for a cut in employee benefits and attached a price tag to her life, using a phrase, "distressed babies," that set off a national firestorm. Girl in Glass is the riveting story of one child's harrowing journey and a powerful distillation of parenthood. With incandescent prose and an unflinching eye, Fei explores the value of a human life: from the spreadsheets wielded by cost-cutting executives to the insidious notions of risk surrounding modern pregnancy; from the wondrous history of medical innovation in the care of premature infants to contemporary analyses of what their lives are worth; and finally, to the depths of her own struggle to make sense of her daughter's arrival in the world. Above all, Girl in Glass is a luminous testament to how love takes hold when a birth defies our fundamental beliefs about how life is supposed to begin. Learn more about the book and author at Deanna Fei's website. The Page 99 Test: Girl in Glass. Pg. 69: Sharon Huss Roat's "Between the Notes"
What is Thomas Cobb reading? Pg. 99: Watt Key's "Among the Swamp People"
What is Shannon Grogan reading? Pg. 99: John Hagedorn's "The Insane Chicago Way"
What is Matthew McGevna reading? Pg. 99: Stanley I. Thangaraj's "Desi Hoop Dreams"
Pg. 69: Shannon Grogan's "From Where I Watch You"
What is Nicole Galland reading? Pg. 69: Robert Masello's "The Einstein Prophecy"
What is Douglas Corleone reading? Pg. 69: Katherine Rundell's "The Wolf Wilder"
What is Stephanie Clifford reading? What is Stephen Emond reading? Pg. 69: Susan Crandall's "The Flying Circus"
Pg. 99: Gary Alan Fine's "Players and Pawns"
Pg. 69: Nicole Galland's "Stepdog"
Pg. 69: Douglas Corleone's "Gone Cold"
Pg. 99: Ann Larabee's "The Wrong Hands"
What is Randy D. McBee reading? What is Naomi J. Williams reading? Pg. 99: Victor Tan Chen's "Cut Loose"
What is Beth Cato reading? Pg. 69: Naomi J. Williams's "Landfalls"
What is Leslie Budewitz reading? Pg. 99: Randy McBee's "Born to Be Wild"
What is Nadia Hashimi reading? Pg. 69: Leslie Budewitz's "Butter Off Dead"
What is David Hofmeyr reading? Pg. 69: Nadia Hashimi's "When the Moon Is Low"
What is Nick Holdstock reading? Pg. 99: Svetlana Stephenson's "Gangs of Russia"
What is Tom Harper reading? Pg. 69: David Hofmeyr's "Stone Rider"
Pg. 99: Justin Gifford's "Street Poison"
What is Sara Nickerson reading? Pg. 69: Camille Griep's "Letters to Zell"
What is James Abel reading? What is Justin Gifford reading? What is Linwood Barclay reading? Pg. 69: James Abel's "Protocol Zero"
Pg. 99: Margarita Engle's "Enchanted Air"
What is Lou Anders reading?